The ERC offers affordable solutions for low volume production. We understand that some prototype tools require more than just prototype volumes. 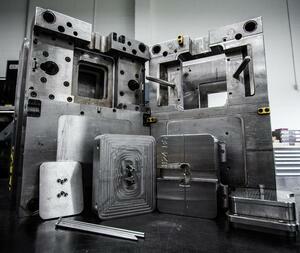 Our prototype molds are built from hardened steel, giving them the durability to be used for low volume production. This offering can bridge the gap between prototype and production or service low annual volumes of production parts (such as service/replacement parts or specialty products). Low volume production saves many of our customers the expense of purchasing production tooling for small annual part quantities. By utilizing our Modular Tooling System, our customers can take advantage of our inexpensive tooling prices and save the upfront capital expense of purchasing production tooling for small annual production volumes. To keep part prices low, we invested in automated injection molding machinery. This allows us to practice lights-out manufacturing, meaning we produce parts even when no one is in the building. Every night, on the weekends - even over the holidays - we are making parts with little to no labor costs. When you cut labor, you cut your part price. Proven RJG technology monitors quality without human interaction to ensure consistent, repeatable parts. With orders up to 100,000 parts per year, manufacturers can now have their plastic prototypes and low volume production parts produced under one roof.